As much as the Scandinavian fused venue Oslo Hackney may seem out of place around the scruffy but authentic borough of Hackney, it could not be better or more conveniently located. Being right next to the overground train station makes it a popular spot for seeing a range of indie and alternative acts. The concept of combining cool Nordic vibes with food of a decent quality and live music has been going down well for quite some time. 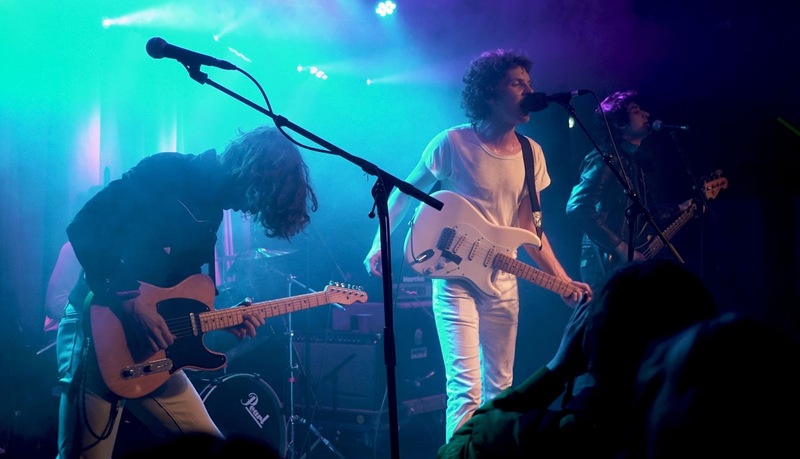 Tonight's NME Awards Show is a big one featuring New York City's Public Access T.V. who stand out from the majority of other bands featured as part of the schedule. Musically complex and interesting, the extent of their eclecticism seems to go deep, it is well anchored in the band and is reflected in their set this eve. Built around their debut Never Enough and their brand new Street Safari, it focuses on two things; being a best of set, but also displaying the range of what the band are capable of. It comprises the best and most popular tunes from Never Enough and the fastest, most funky ones from their second album. 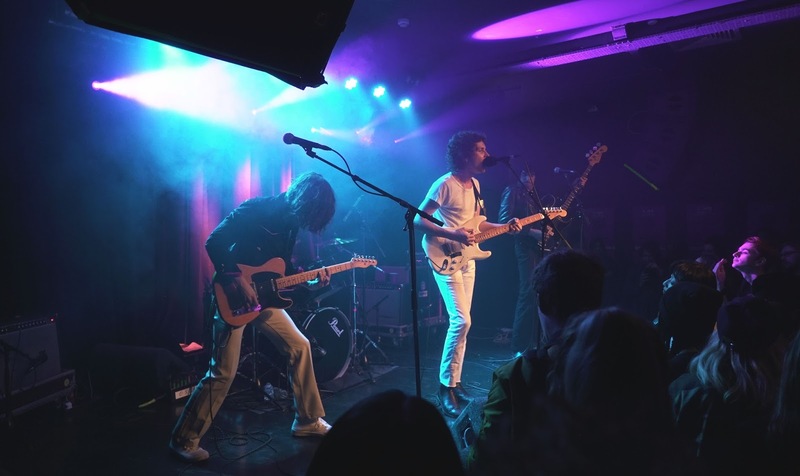 Resembling The Velvet Underground in vibe and guitar riffs, kicking the show off with Evil Disco really works, it makes for a strong intro and invites the crowd to join Public Access T.V. 's celebratory party of rock, funk and disco a la New York City style. PATV then move straight on to On Location and they smooth everyone along as part of a gradual but enticing build up of energy, euphoria, heat and sweat. By the time they have moved on to End Of An Era there is jumping, dancing and singing along in abundance. The anthem like quality of In Love and Alone takes the fans to new heights, they chant the chorus back to the band in a dedicated and eager fashion. The fact that the Brooklyn based band have a dedicated fan base in London is beyond doubt and most of them seem to be here tonight making it an unforgettable and upbeat experience. There is something very special about their music and it go down well with audiences around Britain and London in particular. 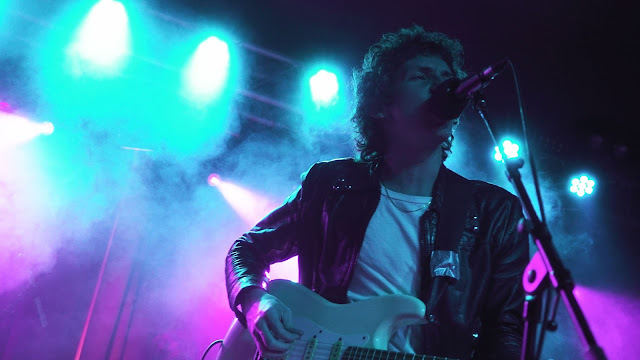 Dressed in a white tee and jeans, possibly to match the colour of his guitar, a black leather jacket and ankle boots, frontman John Eatherly offers plenty of musical know how, nuance and an artistic presence. He converses with the audience throughout the show keeping it lively and engaging. At one point he even declares Metrotech to be 'made for dancing' before feeding back to the crowd immediately after with a 'you guys are great'. One thing is certain, there is plenty of scope for remembering just how good their set tonight has been, as if the quality of the songs and how they are executed in the live environment is not enough. Never one for repeating their own work, or rehashing things for that matter, constantly on the lookout for new inspiration, always keen to explore the edges of what is creatively viable, the four band members continue to place songwriting at the core of what they do. They like to experiment and are passionate about many different genres of music. Having already toured with some of the biggest names in mainstream and alternative music there is absolutely no reason as to why they should not be on the same page as the bands they have toured with and supported. It would be amazing to see Public Access T.V's new album take them a step further than where they are and see them to play bigger venues next time they visit the UK and other parts of the world for that matter.They deserve that and far more.